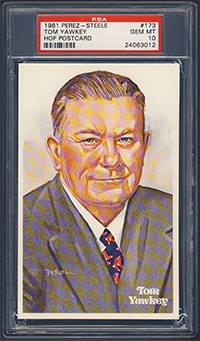 Tom Yawkey is one of the few inducted to the Hall who neither played, coached, umpired, nor served as general manager. In 1933, at age 30, he received his inheritance and bought the Red Sox for $1.5 million. Boston at the time was a doormat and Fenway Park was falling apart. Over the next 44 seasons he spent lavishly on the club and the stadium, doling out another $1.5 million for renovations alone. 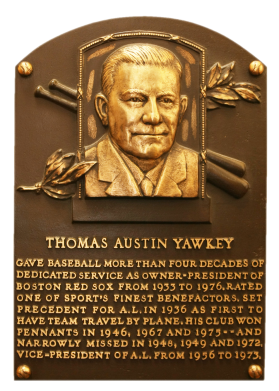 He failed in his one, singular quest: While they became winners, the Red Sox never won the World Series for Tom Yawkey. 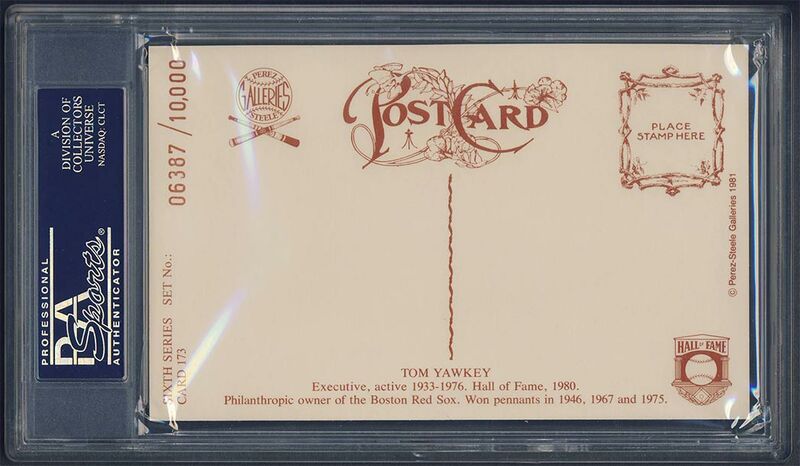 Comments: I purchased my first Perez-Steele Tom Yawkey postcard on eBay in December, 2004 (along with a Rube Foster, Larry MacPhail, Frank Selee, Bill Veeck, Lee MacPhail, Bill Foster, and William Hulbert) from seller Ron Copeland (Copeland Online Collectibles). 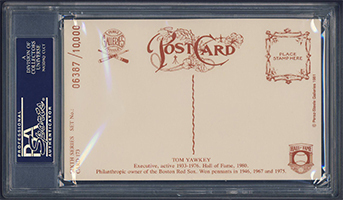 The card was submitted to PSA and graded MINT 9 in October, 2005. I'm still looking for a GEM MT example - help? 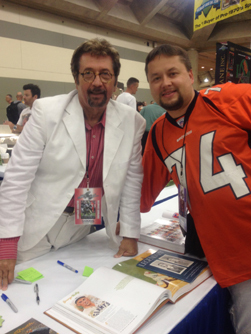 UPDATE: In March, 2015 this GEM popped up on eBay as I was working through my saved searches. Some people read books to fall asleep – I search eBay with my iPhone lying in bed. 4SharpCorners has supplied some of my other Perez-Steele gems so I wasn’t surprised when this one came up. The seller usually runs a discount if purchased via their website so I ran downstairs to my laptop and placed the order. It was 1:00AM!